An anagram is a word formed by arranging the letters of another word, for example, car can become arc and elbow becomes below. The words don’t have to be relevant to each other but it’s fun when they are: listen = silent, dormitory = dirty room, and probably best of all, Clint Eastwood = Old West action. When you rearrange the letters in Samson’s name you get SOS Man and as it happens, Samson was someone who probably should have sent out a few SOSs instead of relying on his own strength. Samson was in the midst of the battle we are all in and his physical strength couldn’t help him. God had blessed Samson with supernatural strength, but Samson wasn’t strong in asking for help when he needed it—specifically when it came to women and temptations—and that’s an issue a lot of us struggle with today. Instead of listening to his parents, taking their helpful advice, or asking for help, Samson pursues his desires. Does that sound familiar? I know it does to me. Even though Samson was going against his people and his parents, verse 4 tells us that “the Lord was at work in this….” God was going to use this to work against the Philistines. The marriage does not work out at all: Samson is betrayed but the rebellious pursuit of his sinful desires did not stop at marrying a Philistine pagan. His desires led him from marrying a pagan woman to spending the night with a prostitute. When we pursue our sinful desires, we will never be satisfied. Blindly following his desires is Samson’s greatest weakness and the trend continues even after the prostitute. Sometime later he meets a woman named Delilah; we don’t know if she was a Philistine, we don’t know how long Samson knew her before he began this relationship with her, but we know that he can’t trust her. She accepts the bribe from the rulers of the Philistines and three times she asks Samson’s secret and three times he lies to her. He had to know something was up and he clearly didn’t want to reveal the secret otherwise he would not have lied. This is another instance when Samson should have cried out for help; he should have sent out an SOS. Finally, Delilah “tormented him with her nagging day after day until he was sick to death of it” (v. 16). Samson gives away the secret, Delilah cuts his hair while he sleep, and then she betrays him into the hands of the Philistines who capture him and gouge his eyes out. Samson let his eyes guide him and here the enemies take them out. He is locked away so long that his hair begins to grow and one day, during a great festival, the Philistines put Samson on display. Finally, after losing his strength and his eyes, we see Samson send out an SOS. In his time of desperation, he calls out and God answers. Even while Samson was chained and defeated, it was not too late for God. Samson spent much of his life chasing after his desires and he suffered the consequences for it. It is a story many of us can relate to. But it wasn’t too late for Samson and it’s not too late for you. Cry out to the Lord, send out an SOS, ask for help because our Lord is mighty to save. 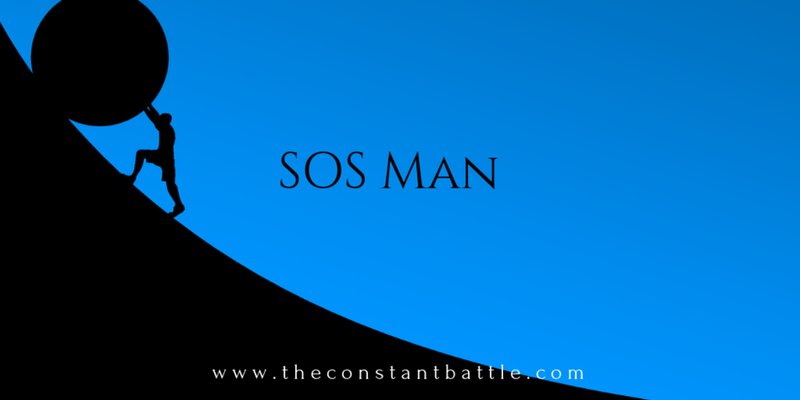 Don’t be too afraid or weak to be an SOS Man.